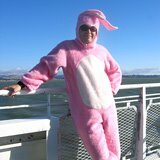 My friend Nicole was just blogging about a trip to Paris and looking for some advice on when to visit. Having done the year abroad thing, I consider Paris to be my second home. Or at least, I like to think so. I've given all kinds of friends advice on where to stay and what to do, I figured it'd be useful information to blog about. WHEN TO VISIT: My favorite time of year in Paris is September and October. August is the worst time to go because the entire country takes the month of August off to go traveling and all that’s left are folks that work in the tourism industry. Many (most?) businesses in Paris close for the entire month. June and July are bad because families with kids and college students all travel during their summer vacations so things are more crowded and expensive. Winter is beautiful, but wet and cold. Spring is also nice, with all the gardens in bloom, but Autumn is just plain gorgeous. Less chance of rain, and beautiful fall colors. WHERE TO STAY: My favorite neighborhood is Montmartre (18eme Arrondissement) just south of Sacre Coeur Cathedral and north of Pigalle. It's a little bit on the touristy side, but not nearly as bad as the Latin Quarter. It's centrally located so you're no more than 2 metro stops away from just about everything. You'll find lots of good restaurants and places to visit, and the whole area feels very lively. There's folks walking around and sitting in cafes and hanging out on the cute curvy narrow streets. As far as specifically where to stay, I found that if you're going for more than a week, it's actually cheaper to find a vacation rental apartment with a full kitchen, bathroom, and bedroom than it is to stay at a cheap hostel with a sketchy shared bathroom and petty thieves trying to steal your passports and camera. The place we found put me in touch with the landlady and required a fair amount of interaction in French to deal with the contract and reservation, but I imagine there are others that don't require you to speak French. WHERE TO GO: Get a copy of Lonely Planet Paris or Let's Go Paris for lots of good ideas. Looking for something a little further off the beaten path? 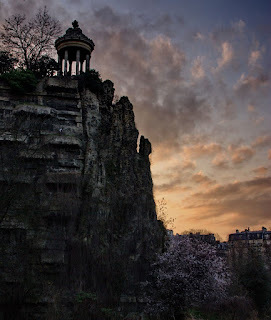 One of the most beautiful parks in Paris is Parc des Buttes Chaumont. It's absolutely gorgeous, and every time I've been it seems all the visitors are locals. Definitely worth a visit. You'll probably want to spend some time walking around Ile de la Cité and Il St. Louis (1ere Arrondissement). Make sure to pick up a couple scoops of Berthillon home-made ice cream while you're there. From here you can stop by Notre Dame and then bop over to the adorable curvy cobblestone streets of Le Quartier Latin (5eme). Don't be tempted to eat there, it's very cute, but since it's tourist food they don't care about repeat business. Hence, the quality of the food is absolutely DREADFUL. I also highly recommend taking some time to wander around Le Marais (4eme). It used to be the Jewish district, and in recent years it has also become the gay district. The combination of cultures makes for some fascinating people watching, shopping, and dining (see Mi-Va-Mi below). BEST RESTAURANT (FANCY): My all-time-favorite restaurant in Paris is Les Diables au Thyme at 35 rue Bergere, 9eme, ph: 01.47.70.77.09. They serve upscale, reasonably priced, traditional French cuisine. They've completely blown me away with impeccable service and incredible food each and every time I've been. Call for reservations, because it's a small establishment with limited seating. Bonus: they have English menus available. BEST RESTAURANT (NOT-SO-FANCY): Mi-Va-Mi in the Marais (27 Rue des Ecouffes, 4eme, ph: 01.42.71.53.72) has the best falafel I've ever had outside of Jerusalem. In fact, when I was there last, I told the proprietor as much and he was so pleased that he gave me a free cup of mint tea. It was absolutely delicious and sweet with a big sprig of fresh mint. That's all I can think of for now. If you need to know anything else, let me know. Photo credits on this blog entry all go to the original artists as linked. nice blog. you did a really good job. I love the photo of the Parc des Buttes. I'm sorry I wasn't able to make it there. Next time, definitely. 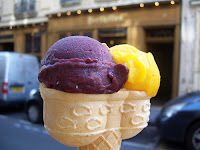 If you're interested in some Paris food tips, hop by my blog Blue Rivers. Flickr is *NOT* a "free catalog where you can pick any photograph you like for your blog post"
Hello! I am writing a segment for the Times of Israel news site and am including information about Mi-Vami. I would love to use the photograph of falafel that you took. Could you please email me with proper accreditation for the photo? This would be a huge help!